The Top 100 is a competition, not a systematic survey of all the world’s destinations to see which are the most sustainable. As a contest, it requires entries—either applications filed by the destinations themselves, or nominations filed by anyone else. The Top 100 are the best of those entries, reviewed, evaluated, and screened by an international panel of experts. We at the DSC were pleased to co-direct the competition, headed by Albert Salman of Netherlands-based Green Destinations. As previously noted, we consider it the closest thing so far to the National Geographic’s surveys of destination quality conducted 2004-2010. There are differences. The Nat Geo surveys polled experts on a pre-assembled list of destinations, who rated them from excellent to poor based on six criteria. Top 100 winners, on the other hand, derive from voluntary entries subsequently subjected to expert evaluation. 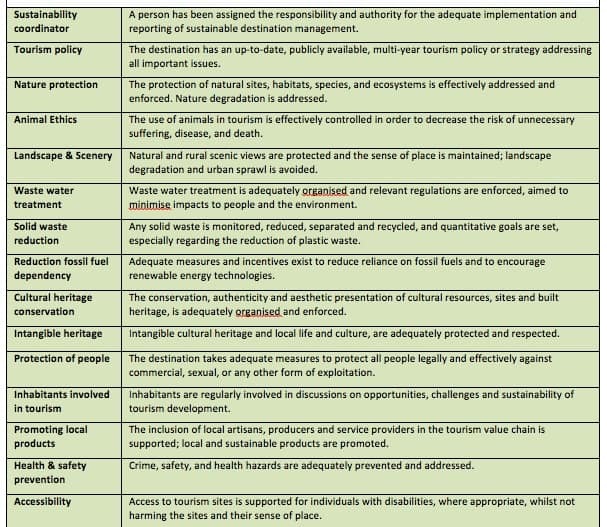 The Top 100 competiton does resemble the Nat Geo stewardship surveys in a key way: It measured destinations against an entire range of 15 criteria, shown below, that define the broad spectrum of destination excellence—environmental performance, of course, but also such elements as historic preservation, scenic appeal, cultural integrity, and so on. 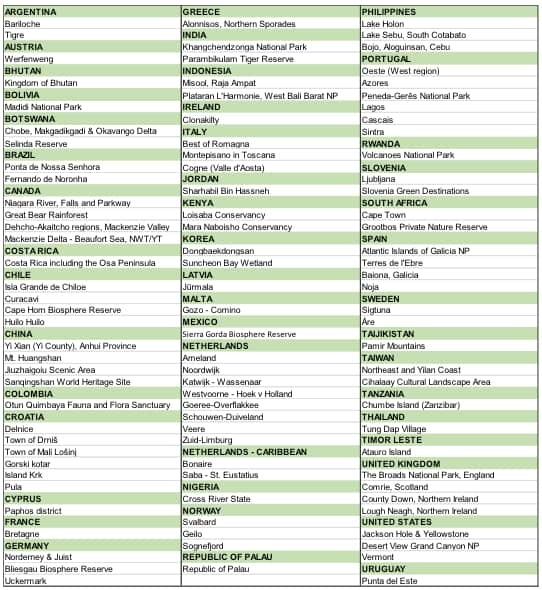 Here, then, are this year’s Top 100: You can see these destinations mapped and illustrated at the Top 100 website. Below are the Top 100 criteria. Winning destinations did not have to meet all 15, but did have to measure above a minimum acceptable standard. Destinations that came close will receive recommendations on how to improve. Each of the winning destinations has a story to tell. We will incorporate the better-known places into our Destination Monitor list. Over the next few weeks we will look at a selection of them and report on what they are doing right. For starters, here’s Valere Tjolle’s report on County Down, Northern Ireland, a Top 100 listee. And here is my own commentary about Slovenia Green in Nat Geo Voices. Perhaps other destinations will find some of the Top 100 achievements inspirational. The value of a competition such as this is to show what can be done, provided people care enough to do it. This entry was posted in Stewardship and tagged adventure tourism, cultural tourism, ecotourism, indigenous tourism, Ljubljana, stewardship, sustainable destinations, Top 100, tourism management, Tourtellot by Jonathan Tourtellot. Bookmark the permalink.